This post is written by Jake Parr. Cameltry is an entertaining game with a terrible name. Released for the arcades in 1989 by Taito (and eventually finding its way to the Super Nintendo Entertainment System in 1992 with a slightly better name ‘On The Ball’), Cameltry combines racing marbles with the power to rotate the stage you must speed your way through. With a timer gradually ticking down, it makes for a game that is equally as challenging as it is addicting. The game is a bit like the arcade classic Marble Madness from 1984. 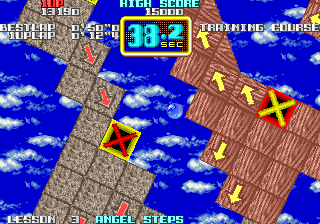 Offering four stages of increasing difficulties and lengths, the objective for each stage is to get the marble to touch the goal by guiding it through elaborate mazes before the timer hits zero. For those who are quick enough, bonus time can be earned, or lost, by smashing certain gems or touching large ‘X’ boxes. It has some great graphics and some odd things flying around in the background, such as clocks and fish. As for the soundtrack, it’s a nice selection of fast­ pace tunes that never get boring to listen to. Instead of moving the marble, the entire stage must be rotated instead! The arcade originally had a small wheel to spin the stage, but other versions and ports simply have the left and right directional buttons. The controls are responsive and smooth, and lack a grand learning curve to get used to. A second player can join as well. Along the way, other obstacles will make an appearance. Arrows will push, typhoons will send the marble spinning spinning, stop/go lights will block off passages, gem blocks will fill up space, and steel boxes will need some serious smashing. Luckily, there is a shuffle button to shake the ball and smash anything around it. A particularly useful item will turn the marble into steel so it can easily destroy anything in its path without being thrown about by typhoons or the like. There are also launchers that offer points and repel anything that hits it at top speed when touched, but really, who cares about points? An interesting feature is a random number generator that will grant players bonus time. It can be accessed on rare occasions. Skilled players can try out a slot machine to rack up extra time for the next level. If a stage is failed, on occasions, a number will be given, and a cursor will scroll around a selection of other numbers. Thankfully, it’s not merciful, so quick reactions are needed. If the player can match their number with its duplicate, a small bit of time will be granted to finish the level, but those who are too sloppy will merely lose a life. It’s a cool inclusion, being generous enough to give the player an advantage without being too appeasing and generous. On the whole, Cameltry is an addictive racing game with plenty of reply value. It looks great, the sounds and soundtrack are nice to listen to, and the controls are smooth and responsive. After beating final stage, it soon becomes a bit of a cakewalk. Those who are interested can bag the game on the PSP compilation Taito Legends Power­Up, for not only does it offer the choice to handicap or appease novices or masters, there is a nice three ­dimensional remake with new maps to try out. Be sure to give it a try, you might lose your marbles over it! http://t.co/1X0Tv0FBwQ – Cameltry Retro Review – Rubbish name, eh? 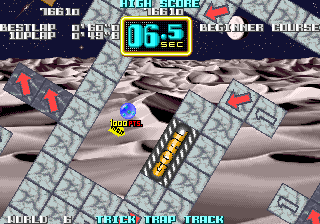 But this game lets you race a marble by controlling the course around it!